Insanity Asylum | The Insanity Workout Madness Continues! Insanity Asylum: Getting Insane Wasn't Enough! People swore that it couldn't get more extreme than the Insanity Workout. They said that Shaun T could not push the human body further, could not get people into even better shape than his original workout. They said he had tapped the body for all its potential, and there was nothing further he could do. They were wrong. Ever since the original Insanity Workout hit the streets, people have been graduating from it, all ripped and mean, and asking: what next? Where do you go after finishing the Insanity Workout? 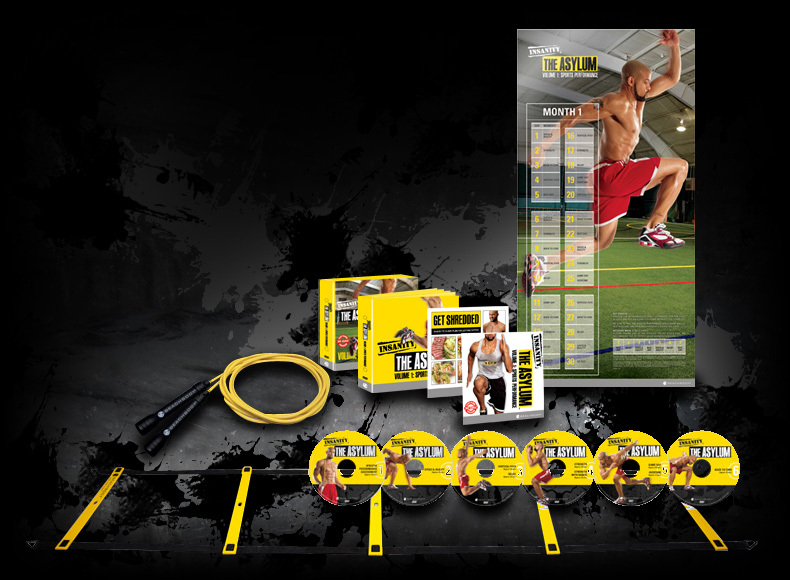 Shaun T has spent these past two years designing the next level for these graduates and other extreme athletes, and the result is a 30 day sports drill oriented workout of incredible challenge. What is The Asylum Workout? With Insanity Asylum Shaun T didn't just remake the first Insanity, following the same principles and ideas, but rather pushed the workouts into a whole new direction, focusing now on achieving maximum athletic preparation for "Game Day", a sporting event of your choice that you wish to prepare for. What does this mean? Shaun T has made a workout that will improve your flexibility, balance, core strength, coordination, cardio engine and explosive power so that you will utterly dominate the court or field. You will push your game to new highs, set new limits, and burn a ridiculous number of calories while doing so, with the end result being that you will push your athletic potential to its extreme limits!